I wish I had more time to work on this post, but here’s a rough idea of what I like this week. Note that CMW now calls the festival portion CMF, details of all the showcases here. Before I get to the CMF picks though, also note that Charles Spearin is putting on his Happiness Project tonight and tomorrow night at the Music Gallery. Details here. 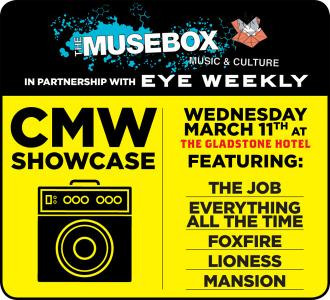 Musebox/Eye Showcase at the Gladstone. Bands start in that order down from 9pm. 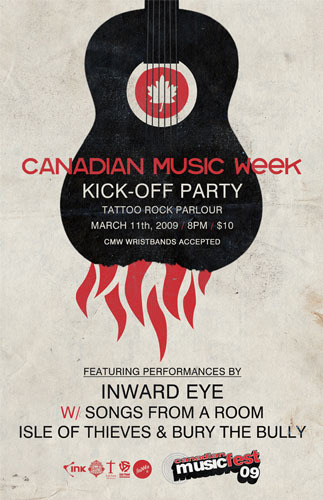 CMW Kick Off Party at Tattoo. 9pm: Laura Peek and the Winning Hearts at Clintons, Emma-Lee at Glenn Gould studio, Ketch Harbour Wolves at The Silver Dollar, The Rest at Sneaky Dees. 11pm: David Martel at Clintons, The Week That Was at The Gladstone, Ruby Jean and the Thoughtful Bees at The Drake. 11:15pm: Keys N Krates at Wrongbar. 12:10am: Chad Van Gaalen at The Horseshoe. 1am: The Rural Alberta Advantage at The Gladstone. 9pm: Dinosaur Bones at The Horseshoe, An Horse at Tranzac, Emma-Lee at C’est What, Hooded Fang at Gladstone. 10pm: Ladies of The Canyon at The Rivoli. 10:45: Green Go at Wrongbar. 11pm: Kidstreet at Supermarket, Japandroids at The Gladstone, Black Diamond Bay at Rancho Relaxo. 1am: D’Urbervilles at The Silver Dollar, Amos The Transparent at Rancho Relaxo. 2pm: No Shame day party with Dinosaur Bones, Great Bloomers, The Rural Alberta Advantage, Peachcake. 8pm: Hey Rosetta! at The Indie awards. 9:30: Arkells at the Indie Awards. 10pm: Library Voices at the El Mo. 10:30: Beast at the Indie Awards.